Dr. Sumayah Taliaferro is a native of Atlanta, Georgia where she attended Benjamin E. Mays High School. She graduated with honors from Brown University and Alpert Medical School of Brown University. Her career began with residency training in the Yale Primary Care Internal Medicine Program, followed by residency in dermatology at historic Howard University. A board-certified dermatologist, Dr. Taliaferro specializes in pigmentary disorders, medical dermatology, surgery, and cosmetic dermatology. Her services include mole removal, surgical treatment of skin cancers, split earlobe repairs, removal of keloids, sclerotherapy for the treatment of leg veins, Botox® injections, and soft tissue fillers such as Restylane®, Juvederm®, and Radiesse®. She is an expert in laser treatment of the skin and provides state-of-the-art procedures for hair removal, aging skin, acne scars, hyperpigmented marks, and broken blood vessels on the skin. Dr. Taliaferro has co-written chapters in Fitzpatrick's Dermatology in General Medicine, the premier textbook of dermatology, and Treatment for Skin of Color. She is a fellow of the American Academy of Dermatology and an active member of the Women’s Dermatologic Society, the Atlanta Association for Dermatology and Dermatologic Surgery, and the Atlanta Medical Association. 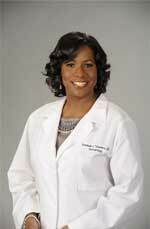 She served on the Board for the Medical Association of Atlanta and led their new Residency Mentorship Program. She has been honored to serve as “Doctor of the Day” at the Georgia State Capital. As an active member of the Medical Association of Georgia, she was selected among her colleagues to participate in the Georgia Physician’s Leadership Academy. Dr. Taliaferro is a regular speaker for the dermatology section of the National Medical Association, serves as an expert speaker for Galderma, a global dermatology company, and has been a guest on Fox 5 Good Day Atlanta and 11 Alive news. Dr. Taliaferro is an avid supporter of the arts community in Atlanta, and is most passionate about dance. In college, she was a member of Fusion Dance Company and won the Minnie Helen Hicks Award for Elocution and Academic Excellence from the Theater, Speech, and Dance Department at Brown University. Despite a 10-year hiatus from dance during her medical training, she enjoys dancing again for exercise and recreation. She recently served on the Board for the Atlanta Dance Connection.